The Dicksonia Antarctica is the most majestic of all tree ferns, and possibly the oldest. Its genus and composition are closely related to the giant tree fern (Coniopteris), which predominated the earth some 350 million years ago, during the carboniferous period. Today the D.A is found growing naturally in the more temperate regions of the south-eastern states of Australia. During the Victorian fern craze, the D.A was referred to by some as the king of the fern kingdom. It was during this era, some 150 years ago that the D.A was first imported into Britain. Examples of these early imports can still be seen flourishing in the great gardens of Cornwall, southern Ireland and Scotland. In cultivation the D.A has proved to be the hardiest of tree ferns and is harvested by sawing off at ground level, after which its fronds are removed. The bare stem is then laid down and stacked in a refrigerated container to simulate winter conditions during shipment, which can take up to two months. On arrival, providing temperatures are above 5c, new fronds will fully develop in approximately 4 – 8 weeks. Once arrived at its new environment the D.A can be planted upright or at an angle, so as to frond and suit its self to conditions. D.As handled in the above manner have a 100% success rate in re-establishing themselves. As with most tree fern the D.A develops a stem, which can grow to 10 metres, at a growth rate of approx 30cm per 10 years. The D.A consists of a fibrous, adventitious root system, with a distinctive reddish-brown colour. Many epiphytes host on this porous stem, including a wide range of filmy ferns, Orchids and assorted under story plants. In spring between 6 and 30 hair-covered fronds unfurl from the top of the crown, at a rate of up to 10cm per day. Singular fronds continue to evolve throughout summer and autumn. Within its native habitat, primarily an evergreen over story, up to 3 sets of fronds remain evergreen. When a 4th set begins to develop, the first, which is the oldest, and hanging down lowest, will die off, forming an insulating skirt. Eventually this will fall off, leaving the fronds base, which forms the trunk. Fronds tend to grow longer in more protected, darker, and humid, locations, where on a mature specimen they can grow up to 3 metres each. Relocated cultivated specimens tend to throw shorter fronds, between 80cm and 2 metres, the more exposed the position the shorter the fronds. In its natural habitat, deep in the gullies of dense forests, the D.A will survive light levels as low as 1%. Light levels affect frond length and colour; more exposed to sun produces shorter fronds of a light yellowish green. Best of all grown in shady position. The D.A is extremely versatile and can stand fluctuations in temperature between minus15c & plus 40c. D.A will condition to most soil types, but with a preference to an organic mixture, leaf mould, peat or acid soil, virtually any soil being acceptable if a hole is dug twice the diameter of the stem trunk. In their native environment D.As are found primarily along streamsides and bogs, under a canopy of evergreen trees, where humidity is high. They cannot be found right on the stream edge, where they are constantly wet. In windy, sunny, or indoor sites, where humidity is low, constant watering is advised, generally 3 to 4 times per week in summer, and o1 to 2 times per month in winter, (this is a guide D.A may need more or less watering depending on conditions). Excellent results have been achieved with a drip watering system to the head of the crown, positioned so as to drip down the stem. Natural nutrient source is derived from fallen leaf litter in the crown, which is broken down to produce a slow nutrient feed. In spring, summer, or when re located, a dose of seaweed or similar foliage fertilizer may be beneficial if applied at half the recommended rate, to the foliage and in the head. Our tree ferns are sourced from cool highland forests where severe ‘roaring forties’ winds, coming direct from the south pole, can cause temperature lows of –15c, along with frost and snow, yet the D.A remains evergreen. This is attributed to the fact that an evergreen over story provides shelter and protection by shedding leaves all year round, which fall into the crown of the D.A these leaves then break down to form insulation for the growing point of the crown. the upper section of the head and stem derive their protection from a skirt of spent fronds. Placing leaves, and or peat compost, in and around the head, can simulate similar conditions and upper stem, for extra protection wrap the head with Hessian or fleece. In severe weather aluminium foil can be used very effectively. Although your D.A should happily live outdoors and give many years of pleasure, if a very wet period is followed by a very cold period your D.A will require extra protection. Problem- Northern hemisphere winters may bring increase moisture levels for extended periods, soaking the porous stem to the core. This when followed by an extended hard freeze, or severe wind chill may prove fatal. Measure- Protection as advised in severe winter protection is therefore always advisable, especially in more exposed sites. 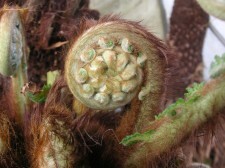 Problem- Fronds which become shorter annually may be slowly dying. Measure- A spray or regular watering onto the stem should reverse this. All our tree ferns are removed from sites prior to development, where if not salvaged they would have been lost. Part of the monies raised goes back into conserving and maintaining the natural areas which won''t ever be developed. Our ferns are all top grade and have been registered with the Australian governent, they are fully fumigated to remove any pests, pathogens, disease or creepy crawleys. Beware of cheap imports where one or more of these stages has been skipped, or the fern has been removed from the wild!